Greenspace & touches of nature really add to the dining environment. Continuously we see the shift towards spaces that are light-filled and embrace the natural world. Floor to ceiling windows that overlook the street scape; gardens and courtyards recreated as green havens; and greenery integrated into cafés and restaurants’ overall design, through potted plants and vertical gardens. Café and restaurant designers are focusing their design on elements such as plant-styling, citrus plants, herb gardens, bi-fold doors, glass louvre windows and timber screens to help soften the divide between the inside and outside. This then works to create harmony between the indoor and outdoor operations of a functional café or restaurant business. As our cities grow into urban metropolises, our lives seem to get busier and our contact with nature diminishes. For this reason we feel more at home and relaxed when we sit in cafes and restaurants that connect us with nature and her beautiful bounties in highly styled garden settings. 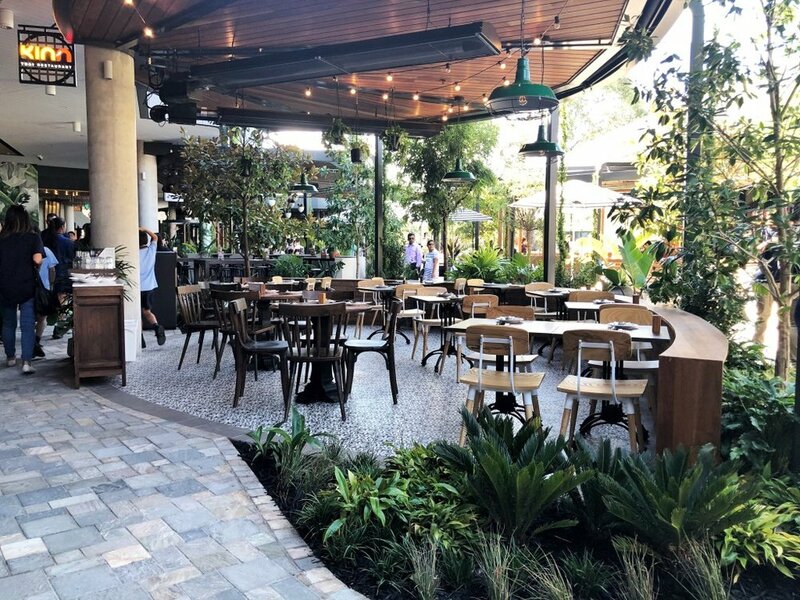 Projects such as Westfield Plenty Valley, Carousel (Perth) and soon to open Tea Tree Plaza as well as Burwood Brickworks have created garden settings from which to compliment the range of modern dining options. The garden setting is nothing new to the Urban City Centre locations, with projects such as Britomart, in Auckland’s CBD, an excellent example. At Britomart the art of plantscaping and botanical styling has added greatly towards the success of the project, now one of Auckland’s premium dining destinations. The curation of the botanical styling requires a strategic approach so as to align budget with the planning for all four seasons, a component of the events and functions programming for these mixed use developments. Our projects take us around the world from Britomart, Auckland to Covent Garden, London. We recognise the importance of naturally influenced spaces - connecting people with the places they want to spend their quality time in. Experiential dining and socialising drives growth across a number of industries. This is reflected in people spaces such as ground floor cafes, dining terraces and roof top bars, embracing nature in the form of living and breathing plants herbs, flowers, trees, and all things green.